The Select Service tab of the TAP load dialogue allows you to choose which TAP service you wish to query. You need to do this before submitting a new TAP query. There are two separate tabs within the Locate TAP Service sub-panel, corresponding to two different ways to select the service you want to use. Use this tab to find TAP services that contain particular tables, or tables relating to particular topics. 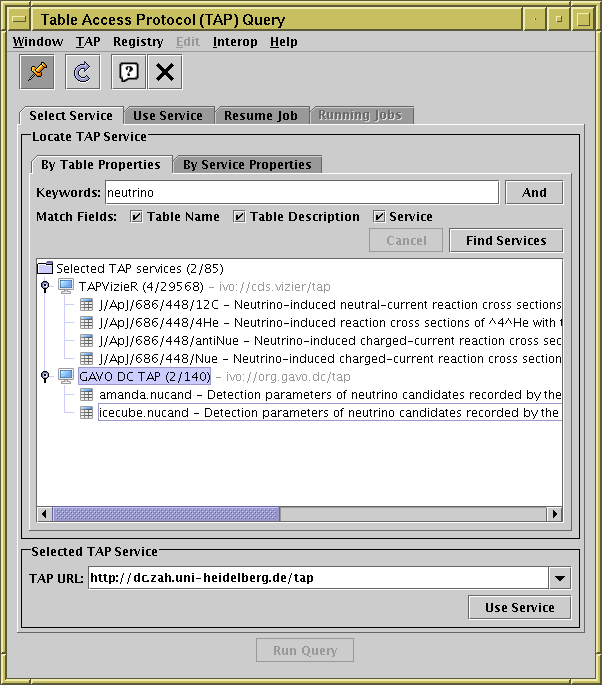 When first opened (or if no search terms are entered), it shows a list by name of all the known TAP services, ordered by the number of tables they contain. If you enter one or more search terms in the Keywords field and hit Find Services (or return), then the list will be redisplayed as a tree in which the children of each service are the tables whose name and/or description matches the search terms you entered (click on the node handles to display/hide the children). You can choose whether to match the Table Name or Table Description using the Match Fields checkboxes; basic Service metadata can also be matched (just name, title, ID; for more complex searches by service metadata use the By Service Properties tab, described below). Clicking the And/Or button to toggle its value determines whether the text from the displayed tables/service text are required to match all of your search terms, or just one of them. When you've decided which service you want to use, click it, and its access URL will be filled in the TAP URL selector at the bottom. Clicking on a table will automatically select its parent service. If you double-click on a service it will take you directly to the Use Service tab. Use this tab to find TAP services based on properties of the service itself, such as the service name or publisher. It is the same as the Registry Query Panel of the other VO query windows. Having queried the registry, click on one of the rows to enter its service URL in the TAP URL field at the bottom. At time of writing there are only about a hundred TAP services registered, so it's feasible to query the registry for them all (hit Find Services without entering any keywords), and choose the one you want by eye, perhaps sorting the displayed services by one of the metadata items (click on the column header to sort). If you know the URL of the TAP service you wish to query, you can enter it directly into the TAP URL field at the bottom of the window without a registry search. This field remembers URLs previously entered into it, so if you click the little down-arrow on the right, you can easily return to services you visited earlier in the same session. The state (entered ADQL etc) of those sessions is also retained. Once a service URL has been chosen in one of these ways, you can click the Use Service button at the bottom (or equivalently the tab header at the top), and you will be moved to the Use Service tab.